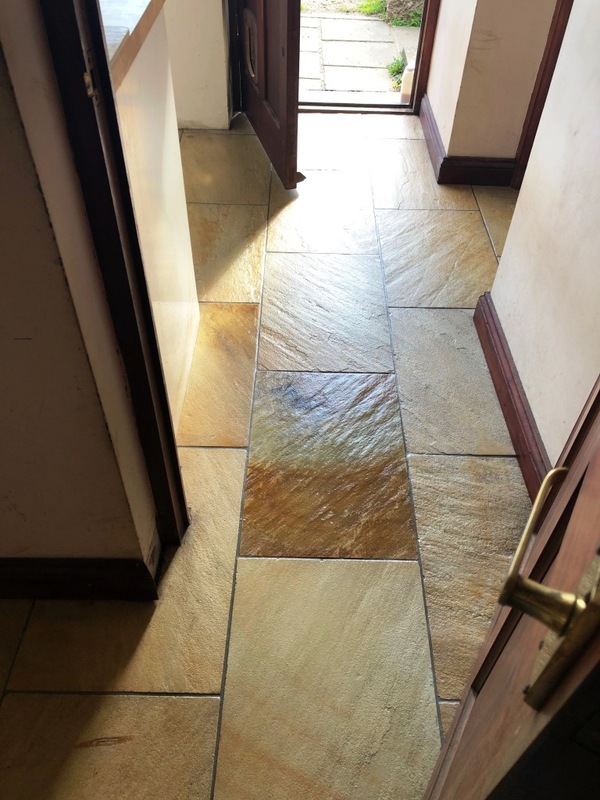 Normally rough stone like this is used on an outdoor patio where the natural texture and riven prevents people from slipping in a wet area, however when used inside you find the dirt gets trapped into the riven textures and clefts of the Sandstone and it is quite difficult to remove. Our customer found that mop heads would get shredded by the rough stone and leave bits of mop material on the stone. 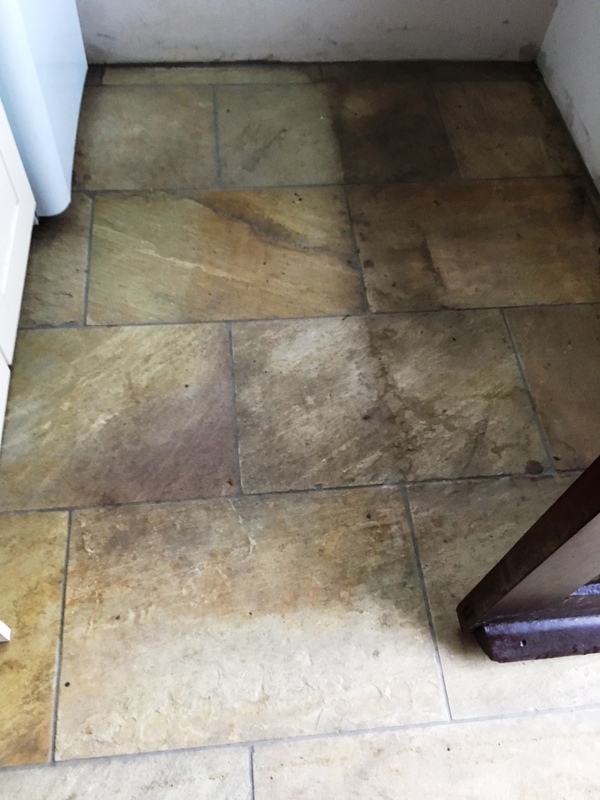 To make problems worse they had originally been advised to use a wax-based sealer on the floor which didn’t last and soon allowed dirt to become trapped in the stone making it even more difficult to clean. 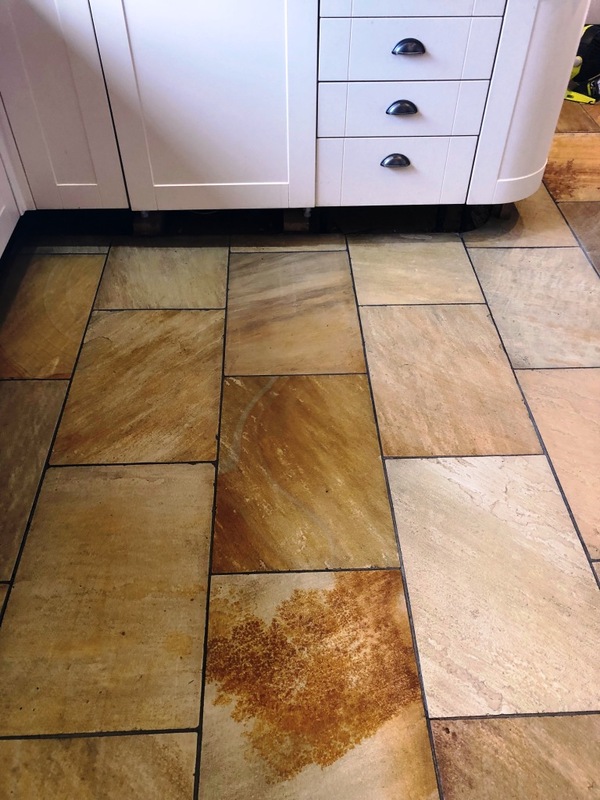 We were asked to deep clean the stone and apply a sealer which would stop the dirt getting stuck into the nooks and crannies of the stone thus providing a surface that could be easily maintained. The property was in Grange Over Sands a town in in the pretty area of Morecombe Bay. We discussed what could be done with the customer and demonstrated the process on a small test patch which came out well and then agreed a price and date to carry out the work. On our return we started the cleaning process by sraying a warm dilution of Tile Doctor Wax-Away on the floor and leaving it to dwell for five to ten. The product was then scrubbed in the stone to remove the dirt and what was left of the wax sealer. The now dirty solution was rinsed off the floor with water and removed with a wet vacuum. 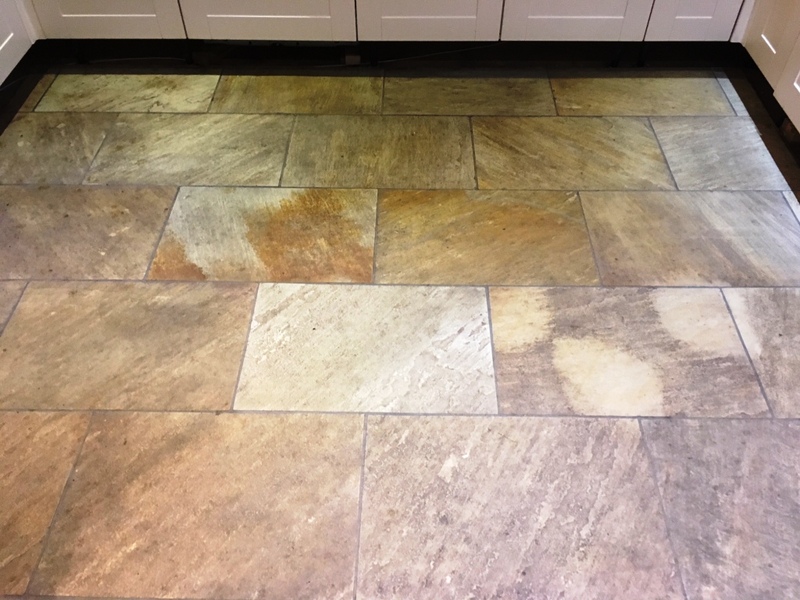 This process cleaned most of the floor but there were one or two stubborn marks which we spot treated with Tile Doctor Remove and Go. This product has a slightly longer dwell time but works well to remove stubborn wax sealers and deep stains and it did not disappoint. The grout was also scrubbed using the same product which made a huge difference to the overall look. We then rinsed the floor with cold water a couple of times to remove any remaining dirt and trace of cleaning products each time using the wet vacuum to dry the floor. The stone was left overnight to dry out and then we called back the next day to apply a fresh sealer. 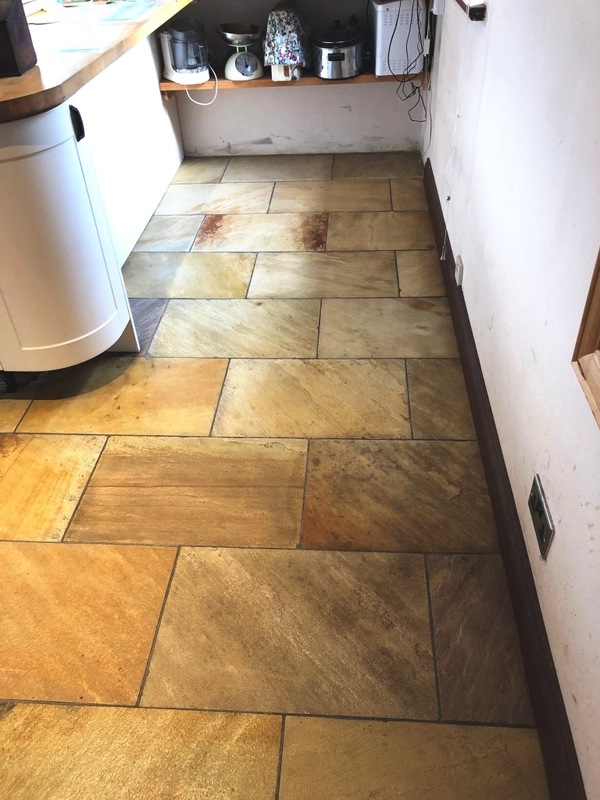 Four coats of Tile Doctor Seal and Go were applied, this is a satin finish sealer which coats the tiles with an acrylic base which prevents any dirt getting into the grooves making the floor much easier to clean going forward as well as solving the problem with shredding mops. 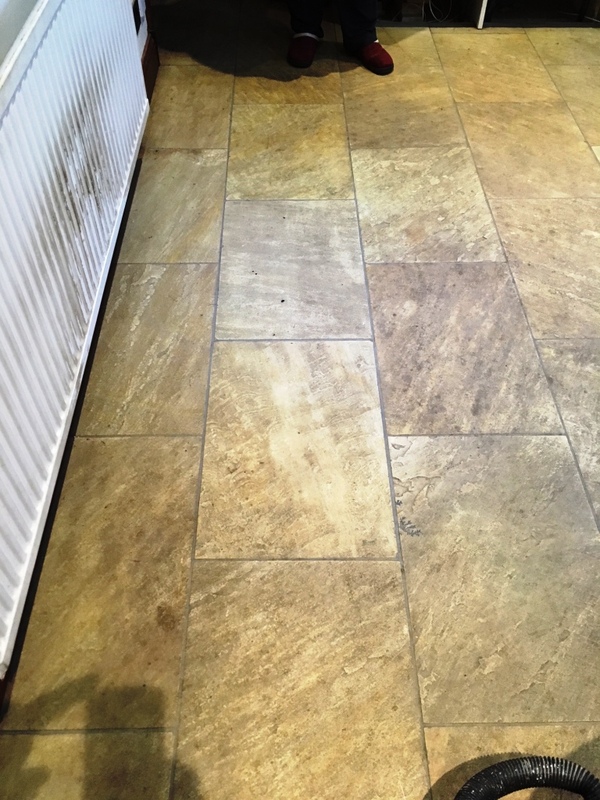 For every day cleaning we recommend the use of a pH Neutral cleaning product such as Tile Doctor Neutral Tile Cleaner which has a neutral pH that will not prematurely erode the sealer like some tile cleaning products which if you read the label are only for use on ceramic tiles and not natural stone. The client was really pleased with the floor, it made a huge difference, you could see the lovely natural colours and patterns in the floor. She could also see that the floor would be much easier for her to keep clean in the future.